These two products are seriously iconic within the beauty blogging world with people being in either camp UDPP or TFSI. For me? Im personally not 100% sold on eye primers. Most of the time I don't feel I really need it and prefer to opt for cream shadows rather than using a specifically defined primer. 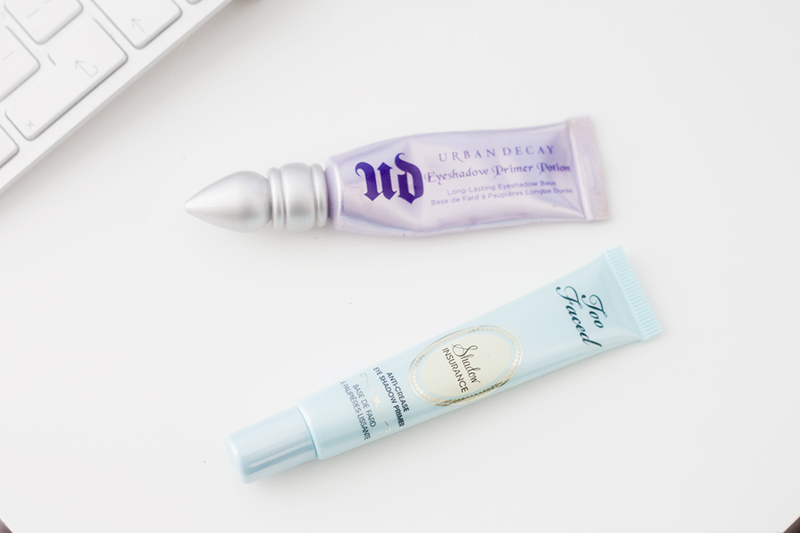 As I recently was sent the Too Faced Shadow Insurance Primer and I thought I'd put it up against the Urban Decay Primer Potion and try and solve the biggest beauty question of the blogging age: Too Faced Shadow Insurance or Urban Decay Primer Potion. Both products come in a tube style packaging and apply as a neutral creamy base on the lids. I primed one lid with the Urban Decay Primer Potion and the other Too Faced Shadow Insurance to give it an event trial. Both keep shadow in place for hours, help the shadow go on smoother eyeshadows and make colours look more vibrant. I checked back at the end of the day and they looked exactly the same! Colour was still there, minimal creasing throughout the day and I found shadow blended effortlessly onto the lid. I also liked that they both neutralised my very veiny, red lids! That all I said I really genuinely I think they are both as good as each other. I think it's just down to personal preference which you personally prefer I think! Especially since Urban Decay Primer Potion was repackaged into a squeeze tube last year, which probably would have swayed me slightly! Urban Decay Primer Potion Vs Too Faced Shadow Insurance? Who wins?